MADISON, N.J. – The Albright defense forced eight turnovers, including five interceptions, leading the 17th-ranked Lions to a 51-6 Middle Atlantic Conference victory over FDU-Florham on Saturday at Robert T. Shields Field. The Lions remained undefeated on the season, and in first place in the MAC standings, by improving to 6-0 overall and 5-0 in conference play. The five interceptions raised the Lions season total to 13 and marked the second time this season that Albright has recorded five interceptions in a single game. Albright also had five interceptions in the victory at Misericordia. Grant Boehler returned one interception 33 yards for a touchdown, and Luis Quinones, Donte Thomas, Steve Barroso and Colton Ryan also intercepted passes for the Lions. Albright has limited the opposition to 48 points over the past five games, which marks the best five-game stretch since the 1983 season. Albright scored 45 straight points in the victory against the Devils after scoring 55 consecutive points in its 62-9 win last Wilkes last week. Mike Knight led the Albright offense as he was 13-of-18 for 171 yards and a pair of touchdowns, while Roemello Monroe rushed for 109 yards and a touchdown. Albright got on the board early in the second quarter after Quinones intercepted a Joseph McCain pass late in the first quarter. The Lions then drove 57 yards in 10 plays and Chris Dawson capped the drive with a 7-yard scoring run to give Albright a 6-0 lead. The Lions failed to capitalize on its next drive after Barroso recovered an FDU-Florham fumble at the Devils 33-yard line. Albright failed to move the ball and Daniel Sobolewski missed a 43-yard attempt. FDU-Florham answered with a game-tying touchdown march on its next possession. The Devils went 73 yards in 12 plays and found the end zone when McCain connected with Esaun Mobley from seven yards out. Albright answered on its next drive to take the lead for good. Knight capped the drive with a 31-yard scoring strike to Khari Jefferson giving the Lions a 13-6 lead with 3:38 to play in the second quarter. Barroso then intercepted his fourth pass of the season on the Devils next drive to set the Lions up on the FDU-Florham 20-yard line. The Lions needed just two play to reach the end zone as Knight found Gerrod Gainerfrom 16 yards out to extend the Albright lead to 20-6 with 2:11 remaining in the second quarter. Albright opened the second half by marching 82 yards in 12 plays to take a 27-6 lead with 10:12 to play in the third quarter. Dawson capped the drive with a 1-yard scoring plunge, his second of the game. After FDU-Florham drove deep into Albright territory, Ryan intercepted McCain and returned it 75 yards to the Devils 10-yard line. Monroe found the end zone on a 1-yard scoring run to push the Albright lead to 34-7 with 7:54 to play in the third quarter. The Lions stretched the lead to 37-6 late in the third quarter. The Lions drove 40 yards in seven plays and Sobolewski drilled a 32-yard field goal, which broke the Albright career field goal record previously held by Dennis Unger. It marked the 45thcareer field goal for Sobolewski. Sobolewski also broke the Albright career scoring mark as he finished with nine points giving him 264 in his career, which tops the previous record of 255 held by Unger. Thomas intercepted McCain on the Devils next drive at the Albright 7-yard line and returned it 31 yard to the Albright 38-yard line, but the Lions turned the ball over on a fumble at the FDU-Florham 33-yard line. But the Lions responded on the third play of the Devils drive when Boehler intercepted a McCain pass and returned it 33 yards for a touchdown upping the Albright lead to 44-6 with 12:13 to play in the game. Following a fumble recovery by Chris Oliphant, Albright drove 53 yards in five plays to extend the lead to 51-6. Quarterback David Gavrilov connected with Kyle Dickersonon a 34-yard scoring strike to finish off the drive, which marked Dickerson's first career touchdown. 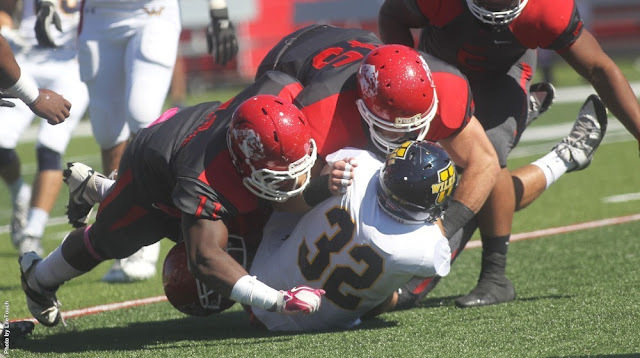 Albright will host Delaware Valley on Saturday (Oct. 24) in a key MAC game scheduled for a 1 p.m. kickoff.